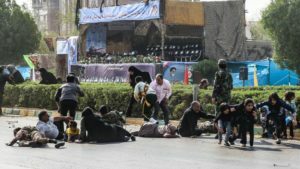 A top commander of Iran’s powerful Revolutionary Guards Sunday called up the United States and Israel to expect Tehran’s “devastating” revenge following the Saturday terror attack on a parade that left over 20 dead. “You have seen our revenge before … You will see that our response will be crushing and devastating and you will regret what you have done,” said Deputy Head of Iran’s Revolutionary Guards, Hossein Salami, in in a speech before the funeral of the victims in Ahvaz. A military parade in Ahvaz, southern Iran, on Saturday, turned sour as four gunmen attacked troops and onlookers. Over 20 people died including 12 members of the Revolutionary Guards. Tehran swiftly blamed the U.S. and its allies in the region for masterminding the attack. The Islamic State group (ISIS) on Sunday claimed credit for the attack, posting on its Amaq agency videos and photos of three men, who were, it said, on their way to carry out the attack. “Islamic State fighters attacked a gathering of Iranian forces in the city of Ahvaz in southern Iran” the terror group said on a messaging app. U.S. envoy to the UN, Nikki Haley, Sunday rejected Tehran’s blames noting that President Hassan Rouhani should look into the “mirror”. Iran also blamed Saudi Arabia and the United Arab Emirates (UAE) for paying and training the attackers. UAE also on Sunday brushed aside finger pointing from Iran noting that the accusations are baseless. The “formal incitement against the UAE from within Iran is unfortunate, and has escalated after the Ahvaz attack,” said Minister of State for Foreign Affairs Anwar Gargash, in a tweet. Meanwhile, the United Nations Secretary-General António Guterres condemned the terrorist attack that targeted the military parade in Ahvaz and expressed his condolences to the families of the victims and to the Government and people of Iran. Posted by KanelkaTagba on Sep 24 2018. Filed under Gulf News, Headlines, World News. You can follow any responses to this entry through the RSS 2.0. Both comments and pings are currently closed.